A few years ago I wrote a thread on the PCGS boards about the excitement of finding a raw, completely original, mid-grade 1897-S Barber quarter on ebay. Not only did the coin possess unmitigated originality, but it was also produced with the center mintmark position on the reverse die. The images of the coin were fairly decent and made the coin look to have original or nearly original surfaces, but the images were too small to see much detail. I saved the images and blew them up only to see that the distortion from the image manipulation was tremendous, but my familiarity with the series led me to believe that the coin retained overall VF20 or so details. An 1897-S Barber quarter in VF20 is darn scarce, one in VF20 with more or less original surfaces is a coin few of us will ever see in-hand; but an 1897-S Barber quarter in VF20 with more or less original surfaces and the very rare center mintmark location? Well, perhaps Sasquatch has a hoard of these, but I had never seen one...until the ebay auction. The seller of the coin ran many coin auctions as consignments and was evidently unaware of the rare mintmark location for this issue and therefore never mentioned it in the listing. The coin was listed as a true auction and I had been bouncing off the walls all week in anticipation of the auction close. My wife had some friends over on the night that the auction closed and they asked what I was doing by the computer. I told them that I was waiting to wildly overpay for this old, worn, dirty coin. The auction closed, my high bid was in the four figures and I won the piece for under $500. Again, I waited patiently for my newest find and it did not disappoint. In-hand I graded the coin VF20 and told a few friends that I thought PCGS might grade the coin VF30. Eventually, the coin was submitted to PCGS and it, indeed, receive a grade of VF30. "My favorite date. Where have they all gone? This coin is only available in AG to VG condition. The moment a Fine or better specimen comes on the market-even with problems-it is sold." "Two far right mintmark positions were identified in the First Edition. A third, in the center, has since been found. I have only seen one high grade specimen (a cleaned AU) of this die (plate coin). An EF has been reported to me." I realize those comments were written in 1994 and without the benefit of the internet, but wow, this was a person who studied, dealt in and specialized in Barber coinage for over forty years by the time that analysis was put in print. For me, finding a more or less original 1897-S Barber quarter in mid-grade and with center mintmark was always the pinnacle of Barber quarter collecting. Of course, one must realize that "the pinnacle of Barber quarter collecting" should not be equated in any way with a statement of market value. Following is an image of that center mintmark coin. 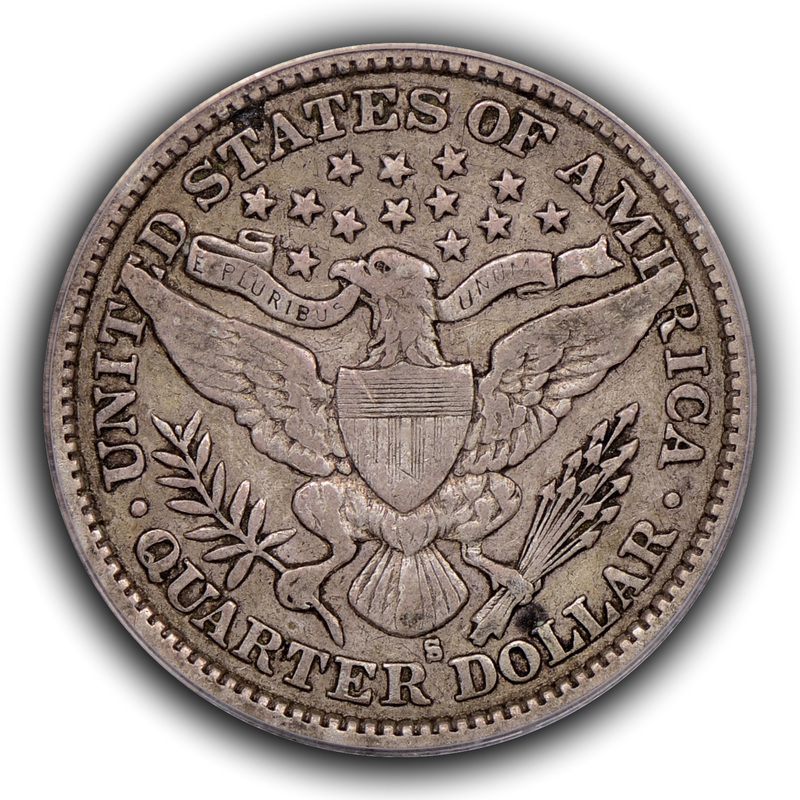 Please note that the position of the mintmark is such that it sits fairly squarely in the void between the words "QUARTER DOLLAR". 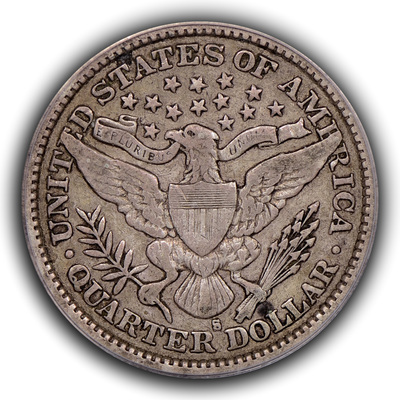 This is in stark contrast to the extreme rightward position of the vast majority of 1897-S Barber quarters where the mintmark is directly above the D in "DOLLAR" and comes perilously close to the feathers on the arrows. The 1897 issues would be the last to feature an extreme rightward S-mintmark position. Although David Feigenbaum had written that he had only seen a few center mintmark coins, the truth is that these pieces are out there; albeit they are typically very well worn or somehow damaged. I make no attempt to preferentially purchase low grade, center mintmark coins for my own collection and have not found a wide audience of buyers to purchase similarly low grade pieces at a premium to the typically encountered coin. 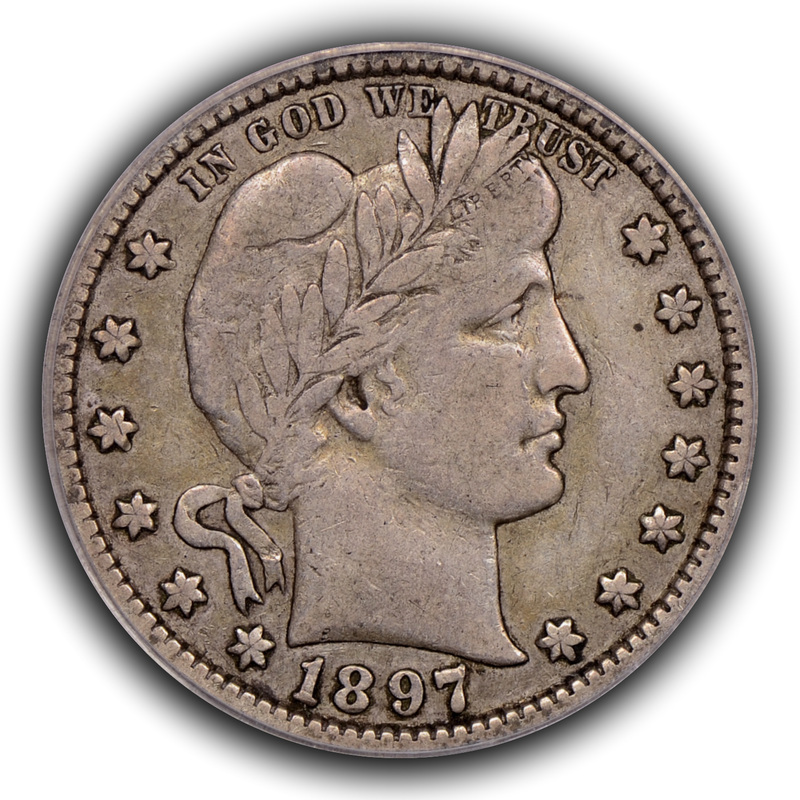 The 1897-S Barber quarter is a fairly easy coin to find and purchase if one is looking for AG3 or G4 pieces and they are sometimes available in higher grades when they have surface issues. I don't know the number of extant pieces, but David Feigenbaum estimated that the center mintmark position was at least one RR value scarcer than the extreme rightward position and the 2006 Barber Coin Collectors Society (BCCS) census indicates that this may have been a conservative estimation of scarcity. A pool of 200-coins would be analyzed or, in the event that 200-coins would take an extraordinary length of time to find, a time window of six-months would be used. The only source of data points would be coins listed on ebay since the ebay marketplace represents the full range of novice sellers, vest pocket dealers and full-time brick and mortar shops as well as boutique or high end dealers. Another advantage of ebay over traditional auction houses is that most coins are sold without certification and low grade 1897-S Barber quarters are generally not targets of certification. An image of each coin in the survey would be saved so that the same coin would not be counted multiple times in the survey. Details grades would be assigned to each coin by viewing the images and those coins with higher details grades had notes attached to them regarding apparent surface preservation. The percentage of center mintmark coins would be determined as well as the average details grade. The mean of the raw numerical grades was not taken since such an approach would give undue influence to those coins with larger numerical grade ranges between grades (i.e. ; the numerical difference between G6 and G4 is two points while the numerical difference between VF25 and VF20 is five points, yet both pairs of grades represent a single, accepted increment in the grading scale) and instead the grades were transformed to an ordinal scale and the arithmetic mean or "average" was taken from this transformation. Center mintmark coins; 12 (5.2%). Average details grade for center mintmark coins; between G4 and G6. Only two of the 12 center mintmark coins had details grades higher than G6 with one of those being a bent VG8 and the other a polished and scratched EF40. Ten of the 12 center mintmark coins had details grades below VG8, which is 83.3% of the center mintmark coins found and examined. Extreme rightward mintmark coins; 219 (94.8%). Average details grade for extreme rightward mintmark coins; exactly G6. There were 20 extreme rightward mintmark coins with details grades in the VF through EF range and of these only a single coin (a VF25) looked to be reasonably original. 185 of the 2019 extreme rightward mintmark coins had details grades below VG8, which is 84.5% of the rightward mintmark coins found and examined. A note of caution should be added to image interpretation. Not only can it be difficult to ascertain details grades for coins offered by myriad sellers using various lighting conditions and having wildly different levels of image presentation proficiency, but interpretation of surfaces is also mighty difficult. As an example, several of the mid-grade pieces were won at auction by myself, but were returned when in-hand inspection determined that they were polished, bent or somehow otherwise damaged. Overall, I was surprised by two items in this survey. First, the percentage of center mintmark coins was 5.2%, which was on the low side of the 5-10% estimation that I had always used. Additionally, a higher percentage of mid-grade details extreme rightward mintmark coins were available than I had anticipated, but the general level of surface damage that these coins had suffered was considerable. There is one major shortfall that has not been addressed in this analysis and that is the tendency of collectors withhold from the market (hoard) better date or more interesting issues. 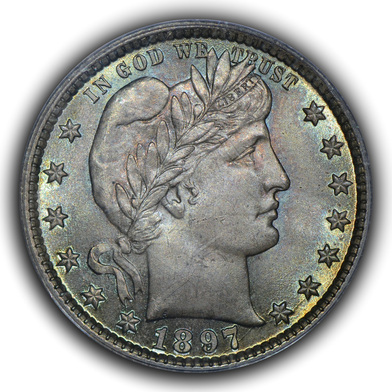 If we keep in mind that the center mintmark position is not widely known of or embraced by the broader hobby; that coins in the lower portion of the grade spectrum generate little, if any, premium regardless of mintmark position; and that there are relatively few original, problem-free, mid-grade coins for this issue (again regardless of mintmark position) then we can be relatively certain that collector hoarding of the issue does not play a major role in the percentage of apparent extant populations. This is especially true if we assume that collector hoarding is much less likely to occur in the lower end of the grade spectrum coupled with the long-term observation that the 1897-S Barber quarter is almost always found in this lower end of the grade spectrum. Lastly, the very good correlation of average details grade and percentage of coins with details grades below VG8 between both mintmark position infers that they were initially used and are currently collected under very similar rules and experience similar collecting pressures.